Could Trey Gowdy’s Questions Put Hillary Clinton Behind Bars? Trey Gowdy, the pride of South Carolina, again showed why he is such a valuable asset to America, the Constitution, and South Carolina. In one fell swoop, Gowdy exposed both FBI director Comey and Democratic presumptive Presidential nominee Hillary. It appears Gowdy has advanced judicial plans for slippery Hillary. Gowdy appeared to be setting Hillary Clinton up for perjury charges. Hillary previously testified about her emails to the House Benghazi Committee. Specifically, Hillary said under oath that she had not sent or received classified documents on her personal email server. Under cross-examination from Representative Gowdy, Director Comey admitted that Hillary lied. Since she was under oath, this sets her up for being charged with perjury. That is why Trey Gowdy is such an important member of the House of Representatives! He set the proceedings to charge Hillary with perjury. Comey admitted to Gowdy that Hillary Clinton’s attorneys scrubbed her devices and server in a way that would prevent recovery of some emails. He also stated that Hillary lied and used multiple devices to send emails. It also came to light during this questioning that Hillary lied about sending classified information, but she had a rationale behind that. Gowdy was inventive enough in his rapid-fire questioning to get Comey to admit that Hillary is shockingly inept to know what classified means! Good morning, Director Comey. Secretary Clinton said she never sent or received any classified information over her private e-mail, was that true? Comey: That’s what I said. Gowdy: OK. Well, I’m looking for a shorter answer so you and I are not here quite as long. Secretary Clinton said there was nothing marked classified on her e-mails sent or received. Was that true? Gowdy: Secretary Clinton said, “I did not e-mail any classified information to anyone on my e-mail there was no classified material.” That is true? Comey: That’s a harder one to answer. We found traces of work-related emails in — on devices or in space. Whether they were deleted or when a server was changed out something happened to them, there’s no doubt that the work related emails that were removed electronically from the email system. Gowdy: Well, in the interest of time and because I have a plane to catch tomorrow afternoon, I’m not going to go through any more of the false statements but I am going to ask you to put on your old hat. Faults exculpatory statements are used for what? 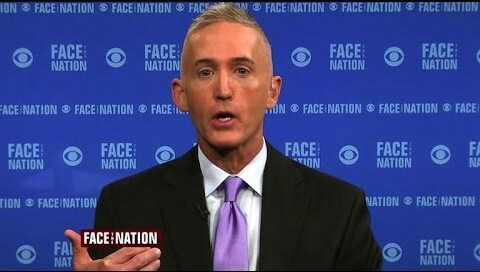 Gowdy: Consciousness of guilt and intent? In your old job, you would prove intent as you referenced by showing the jury evidence of a complex scheme that was designed for the very purpose of concealing the public record and you would be arguing in addition to concealment the destruction that you and I just talked about or certainly the failure to preserve. You would argue all of that under the heading of content. You would also — intent. You would also be arguing the pervasiveness of the scheme when it started when it ended and the number of emails whether they were originally classified or of classified under the heading of intent. You would also, probably, under the common scheme or plan, argue the burn bags of daily calendar entries or the missing daily calendar entries as a common scheme or plan to conceal. Two days ago, Director, you said a reasonable person in her position should have known a private email was no place to send and receive classified information. You’re right. An average person does know not to do that. This is no average person. This is a former First Lady, a former United States senator, and a former Secretary of State that the president now contends is the most competent, qualified person to be president since Jefferson. He didn’t say that in ’08 but says it now. So you have a rogue email system set up before she took the oath of office, thousands of what we now know to be classified emails, some of which were classified at the time. One of her more frequent email comrades was hacked and you don’t know whether or not she was. It never happens that way. You have to do it with circumstantial evidence or if you’re Congress and you realize how difficult it is proved, specific intent, you will form lathe a statute that allows for gross negligence. My time is out but this is really important. You mentioned there’s no precedent for criminal prosecution. My fear is there still isn’t. There’s nothing to keep a future Secretary of State or President from this exact same email scheme or their staff. And my real fear is this, what the chairman touched upon, this double track justice system that is rightly or wrongly perceived in this country. That if you are a private in the Army and email yourself classified information you will be kicked out. But if you are Hillary Clinton, and you seek a promotion to Commander in Chief, you will not be. So what I hope you can do today is help the average person, the reasonable person you made reference to, the reasonable person understand why she appears to be treated differently than the rest of us would be. With that, I would yield back. The source of this transcript is closed captioning. It is the time that we get the full truth and Justice needs to prevail in this case.